Enjoyed the blog hop Melissa. Your designs are superb. Thank you and all your quilting friends for the colorful trip through your book.! Have a great day. Good luck to all of the entrants in the contest. Amazing contributors to your blog hop. Loved seeing all of the projects. Thank you so much. An Irish Chain is on my "short list" as I have wanted to do one for along time! Love the different settings! One of the first quilts I made for a charity auction was a Double Irish Chain. I love the quilts in your book. A fun blog hop Melissa and it was great to see the designs in everyone's blocks as well as your competed quilts. I never would have dreamed an Irish Chain could be made in so many ways. Love the house quilt from the Martingale folks! So sweet and whimsical! I've enjoyed your blog hop. great job! Love your patterns. In fact, I'm working on Super Scrappy Single Irish Chain right now!! Just finished all the blocks last night. Now to start connecting! Congrats on your new book. Congratulations on your book.Anyone of the layout are fantastic.I enjoyed the blog hop! 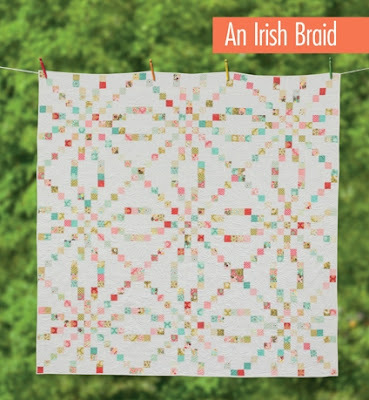 My Great Grandmother was Irish with the name of Bridget--would be fitting to make an Irish Chain quilt in her honor! what wonderful quilts! Would love to try making some of these!